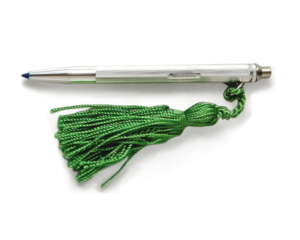 A deluxe pen with engine turned detailing and hand engraving finished off with a beautiful tassel. This pen is made in sterling silver and finished with engine turned detailing and polished to a high shine by skilled craftsmen before being hallmarked at the historic Birmingham Assay Office for authenticity. This exquisite pen is finished off with a soft tassel to add that touch of femininity without being too overwhelming. It would make a perfect gift a birthday or as a retirement present.